I'm not a major sweet-toothed person. If you put an entire family sized bag of Cape Cod sea salt and vinegar kettle chips in front of me, frankly I'd feel sorry for you because I would eat every. single. chip. in under 10 minutes. But if you set a beautiful, glamorous cake in front of me, I may not even give it a second glance. This is not to say that I don't have my share of ghastly vices (see above, re: potato chips). 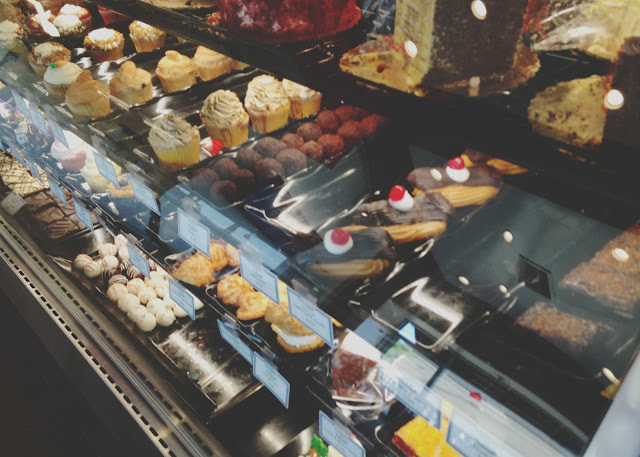 This is also not to say I can't appreciate some good sweets. If anything, maybe it makes my appreciation for them when I do indulge more meaningful? Because birthdays are the best and should never go unnoticed, a while back I designated myself as the birthday-treat-getter of my department at work. Often I bring cookies from French Gourmet Bakery. 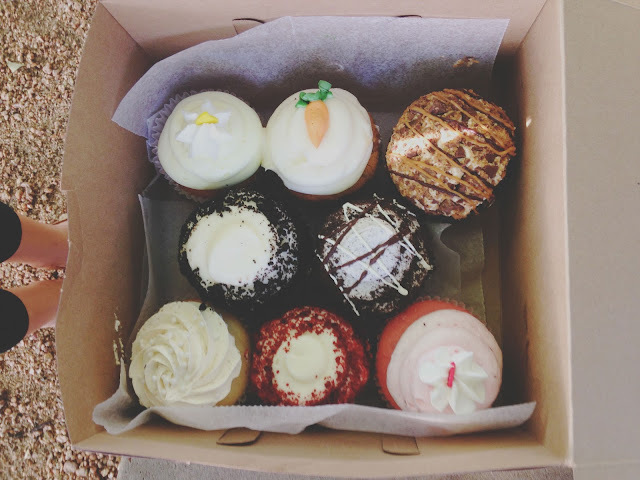 Sometimes I pick up cupcakes from Crave. Kolaches from Kolache Factory occasionally find their way into the mix. Well, on a recent co-worker's birthday, I decided to mix things up and pay a visit to the 3 Brothers Bakery Washington Ave location for the first time. The inside of the bakery is massive and open. 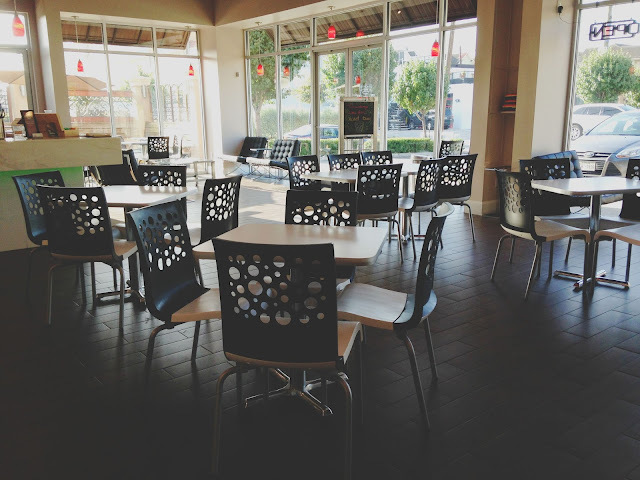 It definitely would be a nice place to beat the heat for a nice little mid-day treat! 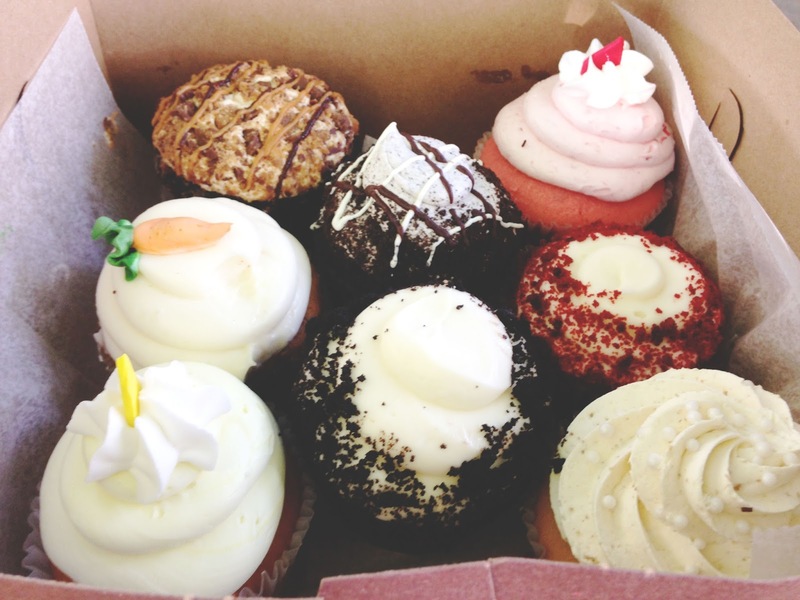 I went ahead and ordered a bunch of different, beautiful cupcakes. Because I truly believe in doing things for the sake of research, I tried three of these for Second Breakfast (help.) so I could report back to you. 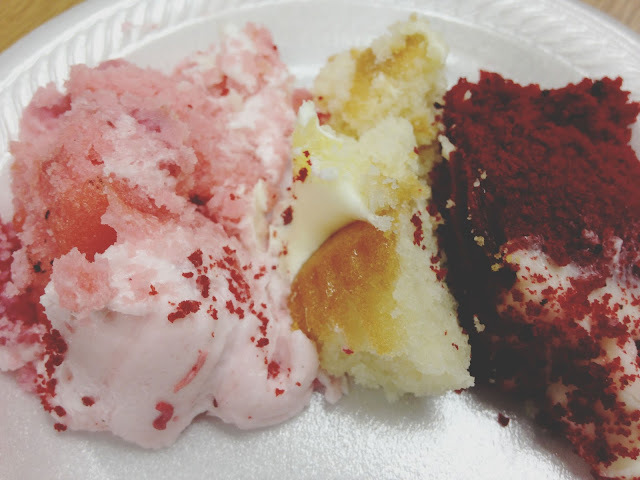 The three I chose were lemon, red velvet, and strawberry. While I enjoyed all of the cupcakes, the lemon cupcake was probably my least favorite of the three, and not because it was bad! It was light, and incredibly sweet -- We all know that I gravitate towards salty (re: POTATO CHIPS), so my favoring the other less-sweet cupcakes should come as no surprise. This cupcake is probably more appropriate for someone who has more of a sweet tooth. I didn't actually taste much lemon because of how sweet it was, and it was not as complex as the other two. 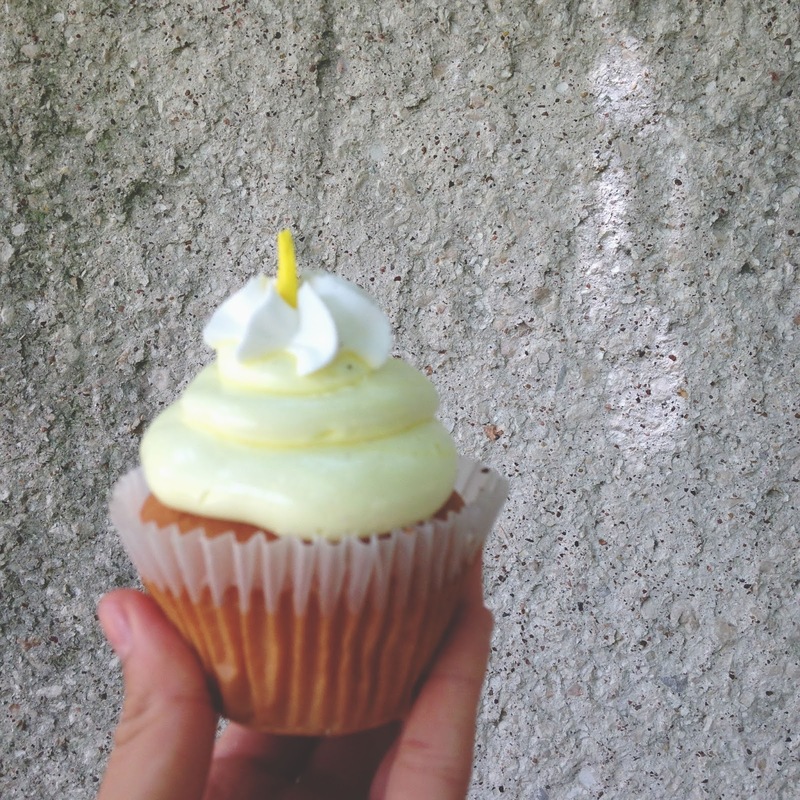 However, the lemon cupcake was fluffy and definitely the lightest of the three, so you could have two and really it'd be like having one, which we are all in favor of, right? Win/win! Now it's time to talk about the red velvet cupcake. I love anything red velvet. Red velvet cake, red velvet cookies, red velvet pants, you name it. So I definitely enjoyed the red velvet cupcake from 3 Brothers Bakery. It was decadent, smooth, and indulgent. The heartiest of the three cupcakes, it was a little heavy for Second Breakfast, but probably more befitting a post-dinner treat (you know. when it's *probably* a more appropriate time to eat dessert.). The cream cheese frosting on top was thick, creamy, and not overly sweet, which gets an A+ from me! (and not whatever the hell I'm doing with my fingers there). This. was. my. FAVORITE. When I lived in New York there was a little bakery in Astoria called Martha's Country Bakery. Their cupcakes were divine, and it was there that I developed my love of strawberry cupcakes. 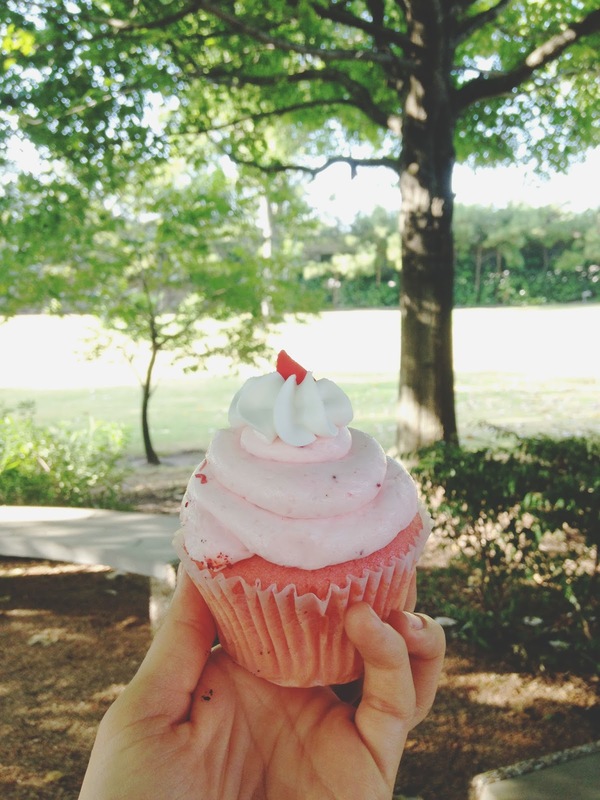 So imagine my delight when I took a bite of the strawberry cupcake from 3 Brothers and absolutely adored it! The cupcake was moist (I know, you hate that word, SORRY. ), wonderfully light, and popping with a playful strawberry flavor. I think there was even some sort of strawberry jelly inside, so dessert within a dessert, yay! 3 Brothers Bakery is a friendly and inviting shop, with a beautiful array of desserts and baked goods. While I'm not an every-day cupcake consumer, I did enjoy my experience there, and I foresee going back on one of my birthday-treat trips. So stop in sometime and try a cupcake! Or you can try a little bit of three different ones like me! (just ignore the awful cutting job I did). How about you? 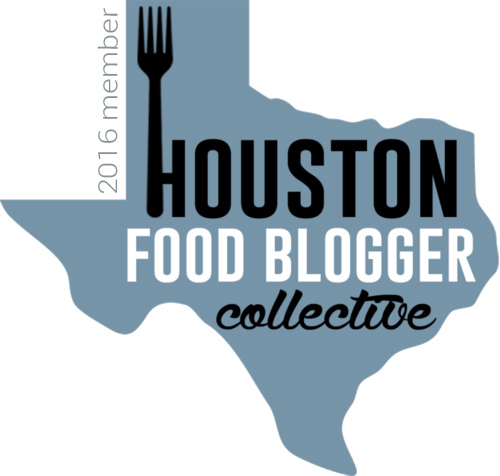 Where in Houston, or on planet earth, is your favorite place to indulge in a cupcake? I'd love to hear about your favorites! Hey "birthday-treat-getter" mine is coming up..LOL.. great post. I love a place with a variety of desserts so I need to add this location into the mix. And now I want second breakfast. The only thing better than second breakfast is second lunch.